Planning a Meeting, Conference or Convention in Georgia? Georgia is a great place for meetings and events, and Georgia Gifts and More is a great resource for all of your convention and conference gift needs. Every year, thousands of companies and organizations choose Atlanta, Savannah, Macon and other Georgia cities for their events. With so many visitors choosing Georgia, we can't help but want to spread a little Southern Hospitality! Destination Georgia -- Everything In One Place! Sometimes planning an event can be a lot of work -- especially if you're planning it from out of town. There are so many questions to be answered. Where can I find Georgia foods for our welcome conference bags? Who has Georgia gift baskets for our speaker gifts? Where can we buy locally instead of having items shipped in? Your answer to all of these questions is Georgia Gifts and More. Our convention services division is ready to assist you with everything from Georgia Welcome Gifts and Hotel Amenity Gifts to Tradeshow Give-aways and Promotional Items. Whether you're creating your own Georgia Welcome Bags or need us to make your conference bags for you, Georgia Gifts and More has everything you need to welcome your guests and attendees to Georgia. 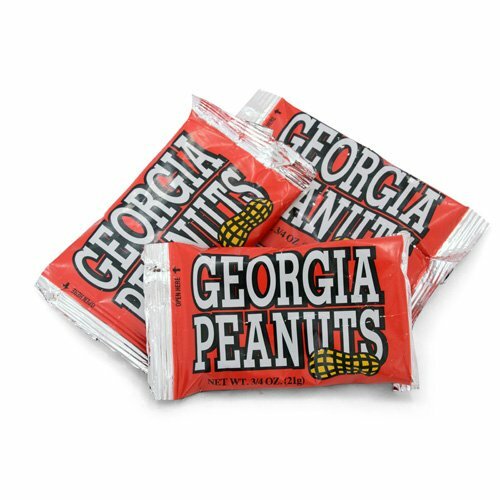 Some of our most popular Welcome Bag Items are Georgia Peanuts, Chocolate Peaches, Peach Jelly Beans, Cookies and Pralines. You'll find them in some of our pre-made welcome gifts, but you can purchase them in bulk for your conference gifts or meeting gifts. They're also ideal for table favors and give-aways at the event. Visit our Welcome Bags Section for more information on: Pre-made Welcome Gifts, Popular Welcome Bag Items and Do It Yourself Packaging. Have Georgia Gifts -- Will Travel! If you're planning a Vendor Marketplace at your upcoming event, we'd love to participate. Bringing our wide selection of Georgia Foods, Georgia Souvenirs and Georgia Gifts onsite for your attendees to purchase gives them value, convenience and selection right at your event. They'll save time and money and will appreciate the opportunity to conveniently shop onsite, and it can also be an additional revenue stream for your event. So, if you're expecting at least 500 attendees, call one of our Meeting and Event Specialists today to discuss your needs at (404) 241-1375.
Who hasn't attended a meeting or conference and didn't receive a totebag, pen, portfolio or other imprinted item from the event? Promotional Products are a great way to thank attendees for coming and help brand your company or organization long after the event is over. Let us assist you with your custom imprinted items. Our Promotional Products website has thousands of items that are just waiting to be imprinted with your logo or custom message. Need ideas? We're here to help. Just give us a call to discuss your needs at (404) 241-1375. Demonstrating Southern hospitality at its best, Georgia gift baskets are an excellent way to thank conference presenters and speakers. From elegant Georgia gourmet foods to some down-home favorites you'll only find in the South, our Georgia gift baskets give them a true taste of the South! For a more lasting impression, our Georgia themed awards, Crystal Peaches and Paperweights are engraved with your logo and custom message as a keepsake for the event. From show-stopping door prizes and gift baskets for your booth to inexpensive items you can put in the hands of every attendee, let us be your preferred partner for Tradeshow Gifts. Whether you're looking for a typical giveaway (like pens, stress relievers, hand sanitizer, etc.) or something with a Georgia flair, (like personalized peach jelly beans, nuts, peach shaped fans, etc. ), you'll find it all here at Georgia Gifts and More! Many of our items can be personalized so give us a call at (404) 241-1375 and let us customize a Georgia gift for you. These Georgia items are perfect for your swag bags, too!